Quick Fixes – Anchorage, Alaska Property Management – Paragon Properties, Inc. These are some of the frequently asked questions we get from tenants about problems which can be fixed quickly by the tenant. If you’re feeling unsure about these quick fixes, please give us a call at 349-1200. 1Q. Why is my smoke detector chirping? 1A. You need to install a new 9 volt battery. It can be tempting to remove the battery all together and forget to install a new one. This is extremely dangerous. We recommend that you have a few spare 9 volt batteries so you can change the battery as soon as this happens. We recommend that you change the batteries every six months. 2Q. My CO detector is giving me a weird code. 2A. The code probably is “bat” which means it needs a new battery. 3Q. Why do I need a CO detector anyway? 3A. 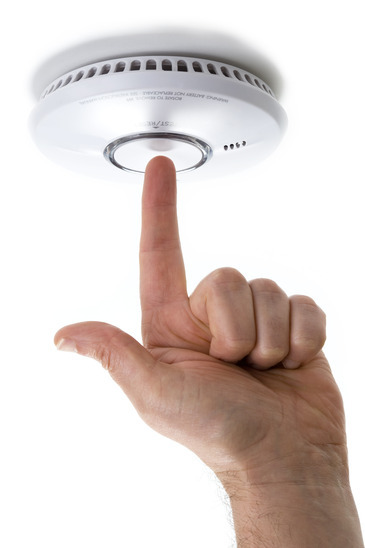 CO detectors and smoke detectors are required by law. CO (carbon monoxide) is an odorless, tasteless, invisible gas which can kill you and your family. It does not take very much CO in the air before it starts affecting you. When you are breathing CO, you do not know it, but your brain and other vital organs are being starved of oxygen. 4Q. The outlets in my kitchen or bathroom aren’t working. 4A. The GFCI protected outlet has probably been tripped. This means that, for example, in your kitchen or bathroom there is an outlet that looks a little different than the others because it has a red button in the middle of it. Try pushing the reset button. Several of the outlets in the kitchen may be on the same circuit and if one of them is off, all of them will go off. You may also find these GFCI protected outlets in the garage or on the exterior of the building. 5Q. My gas fireplace isn’t working. 5A. You probably need to re-light the pilot light. Follow the instructions normally provided on the placard behind the bottom faceplate. If you don’t feel comfortable doing this, give us a call. 6Q. My garage door won’t go down. 6A. The eyes are probably out of alignment. Near the ground on both sides of the door there are two eyes that must be lined up for the garage door to go down. If they are not lined up properly, one or both of them will flash. If this is the problem, the door will go down if you hold the garage door button down the entire time the door is going down. 7Q. My garage door won’t go up. 7A. To get out immediately, pull the cord hanging down from the ceiling and raise the door manually. Give us a call so we can arrange for repairs. 8Q. My garbage disposal isn’t working. 8A. Ensure that you run water every time you run the disposal and do not overload the disposal. If it’s not working, try pushing the reset button for the disposal or use the hex key provided to help free the jam. Call us for more information. 9Q. The water pressure in my sink is very low. 9A. Try unscrewing the part of the faucet where the water comes out (aerator) to make sure there isn’t something clogging it. 10Q. I’ve locked myself out of the house. 10A. If it is during normal business hours, please call the office to arrange to pick up a key. If it is after hours, we suggest you call a locksmith. It is far cheaper to pay for a locksmith as opposed to breaking down the door and then buying a new door when you move out. 11Q. My gas fired unit heater in the garage is blowing cold air. 11A. The pilot light has probably been extinguished. Follow the instructions for re-lighting the pilot light provided on the back of the unit heater. If you don’t feel comfortable doing this, give us a call.